Posted on March 16, 2013, in Uncategorized. Bookmark the permalink. 6 Comments. Yesterday I posted my congratulations on completing your working prototype of the Arduino HPLED shield. It really looks beautiful. I am now really curious to learn your plans re. manufacturing assembled units of your revised boards. I’m working on a couple of projects that could use these boards and I’d like to know if I should plan on follow you (and start building the boards myself), or if I should plan to buy them from you. Will you be selling them? If so, when? Do you have an idea re. what price you’ll be charging for the completed boards? At first, I’d be interested in buying 1 or 2 as prototypes, but if they work in my application, then I’d be interested in buying as many as 10 boards at a time. Please let me know how you’d like to discuss this. I’d be very interested to see what your application for these is. If you don’t want to share this publicly you can email me privately. 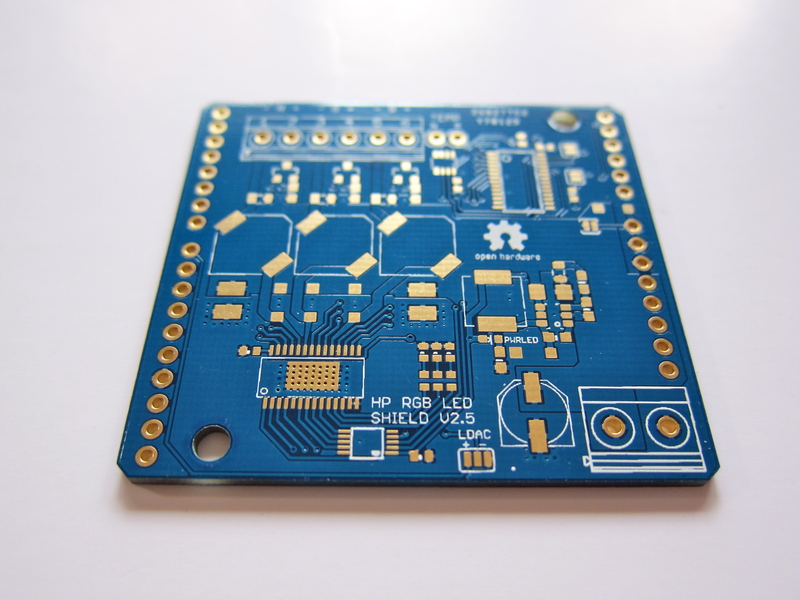 Yes, we definitely want to manufacture, or preferably have these boards manufactured professionally. We’ve talked to a small company specialized in it and have received a couple of quotes. I’ll post more on that shortly on the blog. However, the question is, how many of these boards can we sell. There have been a good number of views on the blog, but very few people have stopped by and left a response indicating interest in purchasing a board. So it is to rather hard to make even an educated guess at demand. If for example we only sell 10 boards in 6 months then I would contemplate making that number of boards myself. However if we approach a qty of 100 annually then we would likely have these manufactured. Do you intend to publish your redesign as open source/open hardware? I am really interested in the v2.5 schematics and BOM. Yes, that is the idea. I have not published the source files yet but will at some point in time. In the meantime I could email these to you. I2C pins (4, 5) or the new ones on the Leonardo and Yún. The board layout on the other hand underwent quite a cleanup. With “he” I was referring to neuroelec who was the initial designer of the shield but then abandoned his creation an the associated blog. The ledshield blog is hosts by two people with me having provided most of the content while re-designing the shield.